← September 4, 1918 – FOOOOM! Our show still revolves around the same theme: and that’s progress. When Carnation Plaza Gardens closed earlier this year to expand the Disney Princess Fantasy Faire, fans were upset because the historic park location had been enjoyed not only patrons since 1956, but also by Walt himself. 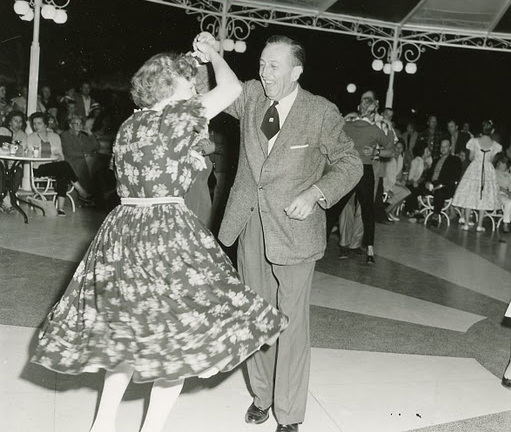 Although Suzy Brown, a spokeswoman for Disney, stated “Swing dancing will return to the park when the Fantasy Faire opens next year,” and that “the area is being designed to host a variety of entertainment, from princess meet-and-greets during the day, to a wide range of musical offerings, including our popular swing bands, in the evening,” fans of the area were of the opinion that it should be left alone. “Keep it vintage. Keep it classic,” said one fan quoted in a piece in The Orange County Register. Walt did not want the parks to be frozen in time (insert Walt-sicle joke here), but he also did not want to lose the essence of the park that made Disnelyand so unique and popular since its grand opening. The oft quoted WDI slogan “Disneyland is not a museum” can be tempered with this quote from Walt himself; “Disneyland will be sometimes a fair, an exhibition, a playground, a community center, a museum of living facts, and a showplace of beauty and magic.” In fact, there is a fantastic piece at Re-Imagineering from 2006 on this very dichotomy, literally asking the question “What did the maestro really want?” (Note to Disney marketing: start a line of “What Would Walt Do?” themed merchandise to kick-off 2014…..you can thank me later. A free condo in Bay Lake Towers is all I ask). Given all of the above, and discussions on various Disney history pages on Facebook, I thought it would be interesting to hear the insights and opinions from someone who was a Cast Member at the parks during periods of change. Don Payne is that Cast Member. I had read Don’s posts in various threads, seen his tribute to Wally Boag when he passed, and marveled at the stories he told about his time at Disney. He is a very cordial, genuine person and has the same approachable personality that Walt had. Now, before I get to the questions and answers, here is a VERY BRIEF review of Don’s Disney career : Don Payne was a Disneyland Cast Member from the mid-1960’s through the late-1980’s. He was hired as a character performer in the premier of the “Fantasy on Parade” Christmas Parade on December 15, 1966 (Walt had passed that morning, if you remember), performed as a character at the “Jungle Book” world premier at Grauman’s Chinese Theater in 1967, worked as a busboy at The Inn Between (an employee cafeteria), a Jungle Cruise host/captain and even performed at the The Golden Horseshoe as the comic lead sub for Pecos Bill (working with Wally Boag!!) and Sam the Bartender. He also had numerous TV appearances (on numerous tours for Buena Vista Distribution) and worked with Phillis Diller, Jim Neighbors as well as many others. Performing as Pluto on The Jim Nabors Hour on CBS, January 29, 1971. 1) What area(s) do you think should be continually developed / refurbished / etc. in a manner that Walt would have approved of? 2) Are there areas and attractions that should be preserved because of how closely they are tied to Walt? The answers will be featured in the next post in the series, but for now, enjoy Don performing at The Golden Horseshoe Jamboree from the 1986/1987 season. This entry was posted in Disney World, Disneyland and tagged Carousel Of Progress, Disneyland, Orange County Register, Wally Boag, Walt Disney, Walt Disney Imagineering. Bookmark the permalink. 1 Response to Our show still revolves around the same theme: and that’s progress.